Wisdom Sparks is a weblog from Phired Up Productions. Phired Up Productions delivers recruitment education for membership organizations. The site also features some free resources, which at the time of the launch, included several articles on recruitment, a Names List database tool, and free access to the company’s proprietary Phi Mountain strategic planning system. Phired Up Productions is proud to be the provider of Dynamic Recruitment education and resources to membership organizations around the United States. Also from Phired Up, be sure to check out Good Guys: The Eight Steps to Limitless Possibility for Fraternity Recruitment. 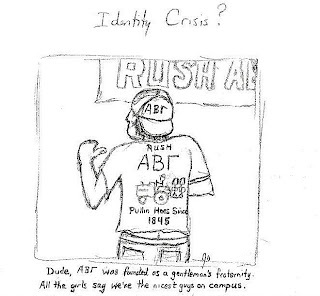 Does your chapter have Rush T-Shirts made every semester? How many members have you gotten because of the time and money you've spent on Rush T-Shirts? with “cool t-shirts” are screen printers. It is amazing to look at the creativity, passion and dedication that fraternity/sorority members have for... designing T-shirts. I swear, if we didn't plan events and design T-shirts, I'm not sure Greek Life would even exist. We come up with funny, kitschy, goofy, disgusting, often offensive slogans, logos and themes, but we rarely sit back and examine whether those things actually get any results. Think of it another way... If you just arrived for your freshman year, and some stranger walked up to you and your parents on campus with a shirt that had the word "RUSH" paired with letters from some foreign language on the front, and on the back of their shirt was some risqué slogan that is demeaning to women or sexually suggestive, would you be super excited to pledge your life to him? Probably not. Your Rush T-shirts belong in the SOCIAL BUDGET. The recruitment budget should be reserved for “results producing activities.” Nobody joins because of a Rush T-shirt. Let’s be honest, the shirts are more for the members than they are for the prospects. Become obsessed with focusing your dollars and energy on “results producing activities.” And if you do make T-Shirts, remember that your Grandma will probably see it someday, and if she doesn't, 30 years from now your 14-year-old daughter will run across a picture of you in it. Just something to think about. Have you never been to MGCA, NGLA, SEIFC, SEPC, WRGLC, SGLC? If you don't know what those letters stand for, be sure to ask a Fraternity/Sorority Professional near you, or check out the links below. Those regional conferences can be an awesome way to get some of the best recruitment and leadership training available in the country for Greeks. Plus, Phired Up will be represented at MGCA, NGLA, and WRGLC this year! Today is the day set aside on the calendar to honor the late Dr. Martin Luther King, Jr. Thinking back about what I know of Dr. King, and because I was sitting here wondering how that ties into fraternity/sorority recruitment -- so I'd have something to blog about today, I'm immediately drawn to two concepts: VALUES and DREAMS. We talk about values a lot in the Greek world. We talk about values a lot. Some committed fraternity/sorority members truly take that talk seriously, and they try to walk the walk. Unfortunately, there is one area of fraternity/sorority life in which values are often forgotten: recruitment. This happens in two ways, 1) Big Rush Events that do not represent core values, and 2) Offering a life-long commitment of sisterhood or brotherhood to strangers based on minimal information or mutual commitment. When selecting members, does your chapter have a set of values-based selection criteria? Or, to take another approach, does your chapter require an, clear commitment from each new member that they understand before joining? Martin Luther King also demonstrated for the world the importance of a DREAM. Consider that the dream that King spoke of in that famous "I Have a Dream" speech was a dream to utterly change the world. This wasn't a goal, a benchmark or even a vision. This was a dream. At the time it was wild, it was extreme, and it was revolutionary. But because that dream was so big... the obstacles, challenges, and sometimes horrible pain that stood in the way of achieving that dream didn't matter to those that believed. Consider how easy it would have been to use all those obstacles as excuses for why King and other leaders just couldn't recruit enough members into the movement. But he chose to make the dream so big, that the challenges seemed inconsequential. Do you have a dream that you're leading your organizational members toward? I realize that equating the Civil Rights Movement with fraternity/sorority recruitment may seem a bit of a stretch -- even silly. But consider for a moment the way in which involvement in an organization like yours can literally change a person's life. Consider the power of a shared commitment to truly live by a stated set of core values which instruct you to be honest, loving, caring and giving. Consider that this is all Dr. King ever asked of us. Maybe they are two different things, but the fraternity/sorority world can learn a lot from the challenges and successes of the Civil Rights Movement, and from Dr. Martin Luther King, Jr. If you have never seen the famous "I Have a Dream" speech, it is one of the most moving pieces of video that I know of. Watch it. So here's the thing... Chapter leaders often spend countless hours working to resolve problems associated with finances, housing, alumni, university relations, apathy, risk management, retention, poor leadership, time management, diversity, stereotypes, etc. Many of these issues are big problems that take big efforts to dent, let alone fix. Investing your time fixing these problems makes as much sense as putting $1,700 rims on a 1996 Dodge Neon. The problem isn't your wheels, it's your car! The #1 thing YOU can do to solve all these problems and aid the long term success of your chapter is ... (drum roll please) ... replace yourself! Look at your list of problems and ask yourself which ones would begin to take care of themselves if your chapter had significantly more leaders who were your level of quality and above. The answer: All of them. See, there are only 2 priorities that strong leaders need to focus on to make their organizations great. People & Purpose. Everything (yes, everything) comes after that. Take personal ownership in recruitment by replacing yourself at least 5 times before you graduate (That's what I call leaving a legacy). The second part is appointing yourself as the man who will force powerful conversations about your organization's Purpose every chance he gets (if you need help, consult your ritual book). Organizations obsessed with their purpose produce remarkable people and do remarkable things. Keep it simple. People & Purpose. Think about it. While delivering training this weekend, I heard two real-life examples from undergraduates about how they've used Facebook to aid in their fraternity recruitment efforts. The Grand Valley State University Alpha Sigma Phi chapter (yes, my alma mater) is using Facebook to maintain relationships with about 13 or so freshman prospects that they met during the fall (because campus policy prohibits first semester freshmen from joining). The chapter started a Facebook group called "Alpha Sig Winter Recruitment 2007," and they've done some pretty smart things there. On the discussion board they've been brave enough to post their chapter's goals for the year in an effort to not only show what they've done in the past, but what they're looking for help with. That was smart! This group of Alpha Sigs also invited not only potential new members to join their Facebook group, but sorority women as well in the hopes that these ladies would bring the men of character that they know along with them. Great job to this chapter -- they've found one way to hold onto relationships despite a deferred recruitment policy on their campus. While serving as a facilitator at the Phi Kappa Theta President's Academy in Bloomington, Illinois this weekend I heard a great story from a guy named Brock, the President of PKT's San Diego State chapter. Brock explained to me that before last fall his chapter was 28 guys and in need of more members. Brock spent most of the summer hunting down men on Facebook who were incoming freshmen at SDSU. One way or another he found about 150 of them and befriended them. By starting with a large pool that included the whole freshman class, and focusing on just MEETING these guys, Brock initiated relationships with larger group of men than the chapter has probably ever had show up to a rush event. Largely from Brocks efforts of GROWING HIS NAMES LIST, that Phi Kappa Theta chapter of 28 men recruited 30 new members for the fall semester -- more than doubling the size of the chapter. Brock added, "The funny thing is that half the guys we ended up with weren't even the guys I was talking to on Facebook -- they were friends of those Facebook contacts." I think there are a few big lessons that can be pulled from these two stories. 1. Because, "You can't recruit who you don't know," Brock focused on just getting to know as many people as possible. Because he worked on gathering names first, he had more potential for success. 2. The Grand Valley guys used NORMAL means of communication to maintain relationships with their hottest prospects -- they didn't keep these guys around by throwing the biggest or coolest events, they just communicated with them in ways that the prospects were used to communicating. Thanks to the GVSU Alpha Sigs and the SDSU Phi Kaps for these stories. My own chapter has recently declared that they must get ready for a HUGE recruitment class during the Spring of 2007 if they want to survive. It turns out that some of the guys are graduating, and others are inactive… after several semesters of not-so-great recruitment efforts, panic is setting in. 2. “Quality” is Not a Valid Excuse. It is a mediocre chapter that says, “We didn’t get enough guys because we put quality before quantity.” If you’re using that excuse, you just didn’t have enough people to choose from to begin with. Trust us, there are enough potential members on your campus of your caliber or better to quadruple the size of your chapter. You just have to meet more people from which to choose. So, start by meeting as many people as you can. No kidding. Meet thousands of people. Your recruitment goal shouldn’t be to recruit 20 guys this semester – it should be to meet 5,000 men and choose the best from among them. 3. Be Unique. Inevitably your chapter will probably choose a theme or a catchy catch-phrase for marketing purposes (even if we advise against it you’ll do it anyway). If this is something you must do, think about how you can position your organization to actually be different from the others on campus. Not just a slight variation on the basic frat theme. Not just the funniest play-on-words that you can fit on a t-shirt. Actually position yourself with a simple, clear, easy-to-understand message that communicates that your organization is different from other fraternities on campus – heck, I’ve even advised groups to not call themselves a fraternity and actually BE something different. But that might be a stretch for short-term results. Identify the UNIQUE value that your chapter offers to its membership (and here’s a hint – you DON’T have the tightest brotherhood on campus because that’s what everyone says, DON’T use your national catch phrases like “To Better the Man,” or “We’re Balanced Men,” and leadership, scholarship and service are not unique.) Think hard on this one. Differentiate yourselves. 4. Do It Yourself. Guess what… if you want to quickly turnaround your chapter, you’re not going to have time to motivate the slugs with the spit-cups at the back of the meeting to do their part. It is up to you. Choose to start the revolution yourself. Revolutions don’t normally get passed by committees – they’re started by wild, independent, brave do-ers and the people who are smart enough to come along for the ride. Leave everyone else in the dust. Do the work yourself, and engage anyone who is open to dramatic improvement and dream realization. 6. Give Something Away. Often, if I’m making a cold-call when doing sales work, I like to open by saying, “One of the reasons I’m contacting you is to make sure you’re aware of this great resource…” It works every time. What can you give away that is of value to others so that you have something easy to talk with them about. Maybe the chapter is having an event that you want to make sure everyone’s aware of. Maybe the chapter is organizing a weekly study night / poker night / bean bag game / basketball tournament / memorial ceremony / philosophy discussion. Maybe the chapter is raising money for charity and giving away a prize. Maybe the chapter is looking for volunteers to serve on a focus group that is evaluating campus life (or fraternity life). Give something away. It makes it easier to talk with people. 7. Do what has ACTUALLY worked before. Often when given this simple piece of advice, chapters will plan to do some big event that they had fun with before. Just because it was fun or seemed cool doesn’t mean it actually drove results. And remember, the most important results are NAMES – you can’t recruit who you don’t know. Think back to what you’ve done before and do the things that have actually driven potential members’ names to a list from which you could choose. 8. Do Something Other than a Rush Event. All frats do rush events. Are you just another frat? If not, do something different than what they do. Do brotherhood or service or social events that you can bring dozens or hundreds of prospective members to. Heck, I’d recommend not doing events at all – they’re often a waste of time and really expensive, but if you’re going to do them anyway, don’t do RUSH events. If you are brave enough to avoid events, try doing normal people activities (lunch, work out, hang out, watch basketball, etc.). After all, it is important that you know that normal people (non-Greeks) are afraid of RUSH events. 9. Ask For Help. “Hi there volunteer club thanks for letting me talk to you for a few minutes, my name is Matt and I’m a member of XYZ fraternity. We realize that the fraternity system here is not great, and because of that many of you aren’t a part of it. We want to change that. In fact, we want to change everything about the fraternity system and to do that we need better men to lead that effort. We need men better than us. We need men like you who do… blah blah blah. All we’re asking is for a chance to talk with you or your friends about a pretty amazing opportunity – to revolutionize the way fraternities are seen on this campus. We’ll even buy you lunch.” Imagine a scene like that at every major organization on campus and with every professor you know, and with every administrator you know… It will work. Matt Mattson, co-founder, Chief Executive Officer, and Performance Consultant for Phired Up Productions. Josh Orendi, co-founder, Chief Operations Officer, and Performance Consultant for Phired Up Productions. Colleen Coffey, Performance Consultant for Phired Up Productions. Jessica Gendron, Performance Consultant for Phired Up Productions. We look forward to learning along with you. For more information on Phired Up Productions, visit our website. "We are the recruitment experts." Phired Up Productions delivers recruitment education for membership organizations. Since 2002 Phired Up has been working to revolutionize the college fraternity and sorority world. The company has delivered high impact training and consulting services to campuses and organizations across the country. Through highly interactive programs, focused consulting services and relevant support publications, the Phired Up team strives to ignite the minds and improve the performance of fraternity and sorority members.